This weekend was just the rejuvenation I needed - family game time, pool splashes with my 17 month old nieces, home cooked meals & pug snuggles! Sounds like the perfect weekend! Loving your blue skirt! These photos of you are SO fantastic–seriously, you look like a model! LOVEEEE all of this! That first photo of you is so adorable! And I'm obsessed with this entire outfit! You look absolutely gorgeous! I love that first photo, and your outfit is so breezy! I'm glad you had a great weekend!! You are looking so happy & perfect in this outfit....I love the color & the twirl of that skirt! Those are some of the best earrings I've ever seen! So pretty and such a unique design. I love how they're vintage looking, but with hot pink accents. Love! What a fun skirt! Sounds like you had a wonderful weekend. Glad you had a good weekend! Love the skirt and those earrings are GREAT! Your weekend sounds divine Jessica! I love this shade of blue on you. I love this outfit so much! That twirly skirt is perfection! 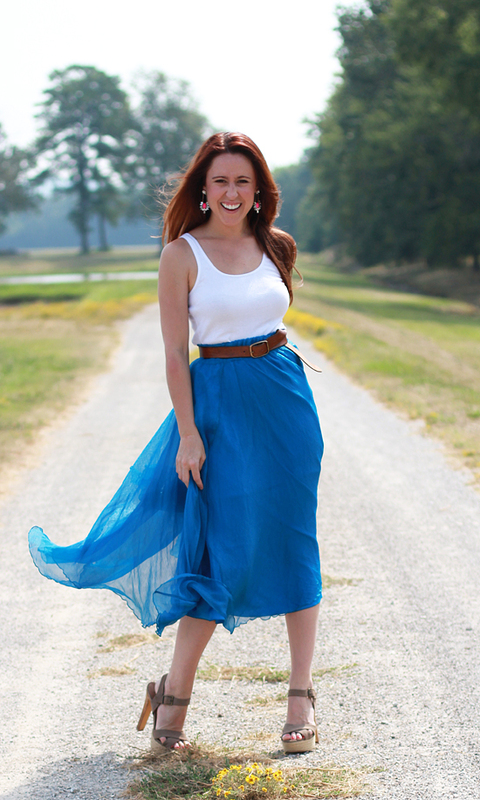 Loving this skirt and your pictures are absolutely lovely! Those earrings are gorgeous and so perfect with your blue skirt! what pretty earrings! and I love the simple white tank top with that outfit! So pretty :) Love your look! Who needs TJ Maxx...Shop at Sale-Rack! So so SO pretty! You have amazing freckles :) Love the skirt on you. Love this outfit, it's so simple and so fun! That blue is YOUR color Jessica! I would totally twirl in that too. Loving those earrings and the landscape in the background! Love a twirly skirt! So pretty! Twirling in that skirt looks like so much fun! Love this look for the long weekend! Gorgeous skirt!! And I love your freckles! So jealous!! :D You look like you're having fun! Glad you had a good weekend! Jessica!!!!! Girl, that first photo needs to be in a magazine!! And the raw close-ups??? YOU are were blessed with the natural gorgeousness!! LOVE LOVE LOVE and then some!! Between these photos and the previous posts of you sitting on a dock, it's really amazing to see how far your photography has come. You really have an eye for taking great photos! Gorgeous shots, and that skirt is such a pretty color! What fun pictures! The color of your skirt is gorgeous!! oooooh you know how to make me smile! Thank you so much - the tripod photography is definitely a love/hate relationship, but when the photos come out ok, it is so much more gratifying because I did it all myself! Still learning new things/tips/tricks every time I go out to shoot! Thank you dear! I always thought that I was most drawn to reds/oranges, but looking at my closet is telling me that I am a gray/blue kinda gal! My thoughts exactly! I'm glad to hear that you like them too! you are too kind my dear! Hardly, but your sweet words definitely made me smile! haha I always say I should have been born a freckle faced redhead but unfortunately that part of my Irish lineage stopped right before me. lol You're welcome! Wooow, I like very much your sandals. You´re looking very wonderful. It looks much better when you leave them unbuckled. Have you ever thought to try it several times?